Around 5:50, the director and the screen writer of Little Witch 2, Yon Yoshinari and Masahiko Otsuka came up on stage for a brief introduction. They thanked all the western fans for their support in helping make this possible. They then had everyone in the audience do an epic countdown starting from 10. After the countdown it was announced the digital downloads for the kick starter backers were now available to download, but by default we would be exactly the first group of people to watch the finished product. Note the director kept on stressing the fact that production on this literally finished 3 days before they arrived to AX, and that no one else had actually seen the complete finished product in its entirety. I was pumped and ready, and by the sounds of it, so was everyone else in the audience. When it started, there was loud applause and finally the moment we had all been waiting for had begun. I have to admit, before any of this I was afraid the showing would be raw instead of subbed, after all they admitted they only finished not even a week ago. Thankfully my worries were squashed within the first 25 seconds. After settling down I was able to relax and enjoy the film. Though relaxing is probably the wrong word. The audience was really into it, with much laughing, gasps and awws, even applauding occurring during the film. Minor spoiler, but what I thought was amazing was the fact that when the actual live audience was cheering, it was exactly at a moment in the film where people in it were also cheering. It felt like Trigger was breaking the fourth wall with their audience. Once you watch it, you’ll know what I mean. Watching it in that huge room with loud booming speakers was a great experience. After the credits started rolling, there was a standing ovation for about a good 45 seconds. During the credits, another thing that I thought was awesome was that during the section thanking their backers, they actually had a section of all there western backers, which you could tell because the names were in English. It really shows Trigger appreciation of its Western fan base. Anyway here are some of my initial impression of Little Witch Academia Enchanted Parade. Some spoilers, but I’ll try my best not too. Note these will probably be biased due to me absolutely loving and adoring pretty much anything by Trigger (if your somehow an Ichika and could not tell). Also, I would not exactly rate my ability of being a “reviewer” to be very good. According to some on the internet, they felt that the animation quality had dropped. Personally, I’m not to sure. I think maybe I saw some parts, but I’m not exactly sure. The animation looked pretty much the same as the first one. What I did notice was that some scenes looked very Kill La Kill inspired, in fact one of the backgrounds was clearly the same one used during one of Mako’s alleluia moments. 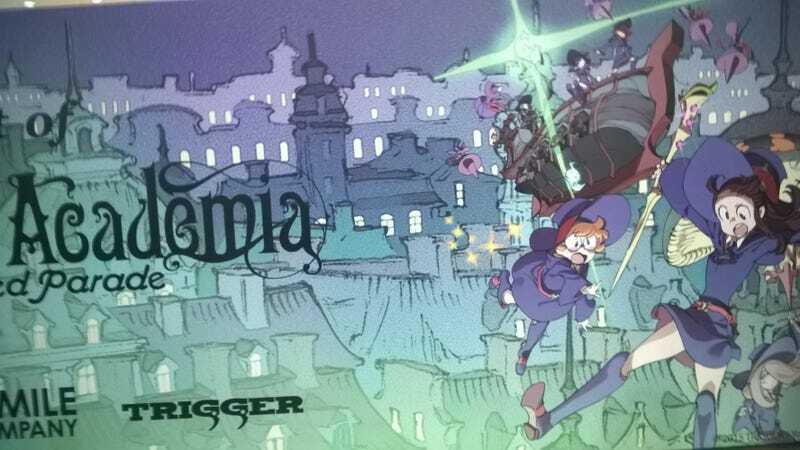 That’s probably not too much of a surprise since Trigger had to work on that series in the middle of making Little Witch. There was a bit more slightly serious tone and themes in this one. But it was still humorous. Took a bit more of an almost anti humor approach. Meaning they were many jokes in which it kept a gag go on longer than expected, but it ended before it became not funny. There was a bit more character drama this time, involving Akko’s Honoka Kosaka personality clashing with that of her friends. That is, the shy and pushover personality of Lotte; and the gloomy, somewhat mad scientist personality of Sucy. Overall, this drama did feel a bit cliché. Overall, it’s predictable, but what can you expect? It’s supposed to be targeted towards all ages. The three new characters. While somewhat stereotypes, they were still charming and a welcome addition. Though they seem to steal some spotlight from Sucy and Lotte. More magic and some world building. New character Jasminka voiced by (I’m pretty sure) Saori Hayami, was really popular with the audience. Diana is exactly the same as she was in the first one. The climax and ending of the battle still keeps that awesome ridiculousness because it’s Trigger. Still a charming tale of magic, friends, and the power of believing in yourself that has heart. Overall, I think that Little Witch Academia The Enchanted Parade is just more Little Witch Academia, which is definitely not a bad thing. I still love it, and on first reaction I want to say its just as good as the first one. I’ll have to watch it again to see if my opinion changes, but for now it seems likely it won’t. This event is something that will probably be my fondest memory of AX.